August 26, 2016 | By jmitchell | Filed in: Communication, Language, Making Materials. 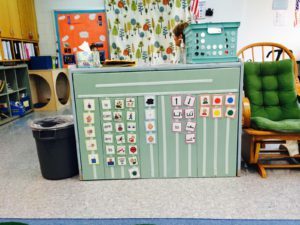 Every classroom with nonverbal or minimally verbal children needs a Classroom Core¹ Board! 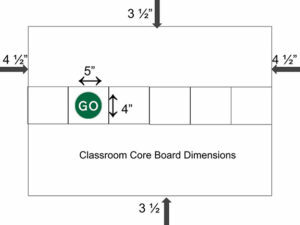 This tool can be used for morning group instruction AND will provide ongoing exposure to the target core words. Language concepts (core words) should be taught in a short, interactive hands-on activities that explicitly teaches the concept. 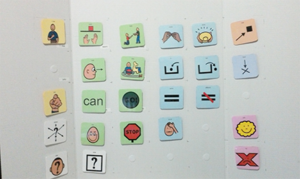 Nonverbal and verbal students (who need to learn language concepts) benefit from the use of the Classroom Core Board. After printing the symbols, I laminated and attached them to self-adhesive foam sheets. The foam adhesive made them more durable and gave them a sturdier hold. I used Velcro to attach them to the board and wrote the word on the board to help them get back to the same location. ¹Core vocabulary is defined as a small set of unchanging words that are used across contexts. Core words can be presented in groups that correspond with the way young children learn language. Core words that I start with are…. I, you, want, help, look, play, can, go, like, stop, more, done, in, out, same, different, uh-oh, that, here yes, no/not, what, where, who.